The input of bird-disseminated seeds into four old fields of different structural complexity was examined. Seed input was greatest along the edges of fields. Significantly more seeds were found in a 13 year old field that had structurally complex vegetation, than in a 3-year-old field with a single layer of vegetation. The lower input into the latter field was a function of both low fruit availability and low structural complexity of the field. Similarly, more seeds were found in a 2-year-old field which had artificial structures, simulating saplings, placed in it than in an adjacent control field of the same age. The shape of the structures was not a significant factor in the input of seeds. Timing of seed deposition was correlated with fruit ripening times, relative nutritional value of the fruit and the movements of frugivorous birds. The input of bird-disseminated seeds into fields appears to be directly related to the structural complexity of the vegetation. 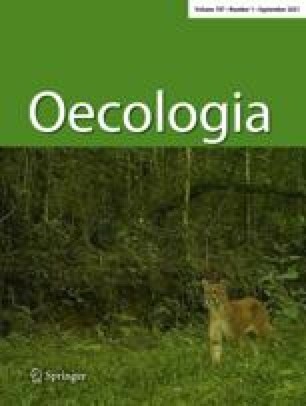 Woody plants increase the structural complexity of the old fields and serve as recruitment foci for bird-disseminated seeds. Thus, seed deposition by birds influences vegetation pattern, and conversely, the presence of recruitment foci in the vegetation may influence bird dispersal patterns of bird-disseminated seeds.